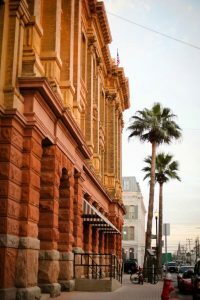 Here are our favorite things to see and do on Galveston Island. Look around at the photos, videos, information and links. Galveston Island offers something for every kind of beach goer and provides the perfect recipe for water activities. Take generous amounts of water, add semitropical temperatures and gently stir with a sea breeze. 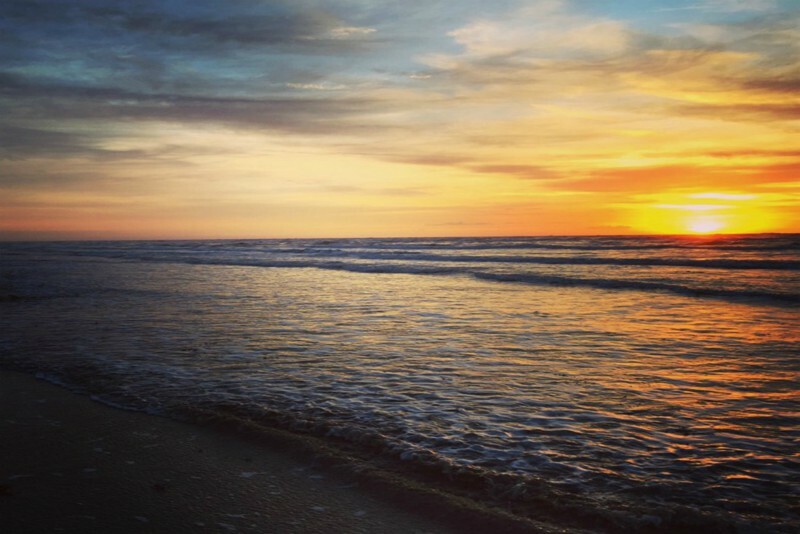 The Galveston Island State Park was named one of the top 5 “Best Gulf Coast Beaches” by Travel Channel. The park offers a quiet oasis on the island’s West End where visitors can explore the Gulf of Mexico or Galveston Bay. Families can swim, fish, picnic, hike, mountain bike, paddle, camp, study nature, bird-watch or just lie on the beach. The park protects 2,013 acres of dunes, estuaries, wetlands, brackish ponds, and beaches. Habitats include surf, beach, dunes, coastal prairie, fresh-water ponds, wetlands, bayous and bay shoreline. It has numerous trails for scenery and wildlife viewing. The island’s West End offers a quiet oasis miles past Seawall Boulevard. The area is home to two “pocket parks” which offers long stretches of sandy, open beach to enjoy frolicking or wading in the Gulf. Pocket Park 1 is located at 11102 San Luis Pass Road on Galveston’s West End. The park is minutes from 61st Street and island attractions Moody Gardens and Schlitterbahn Waterpark and includes a children’s playground. Beachfront parking is available. Pocket Park 2 is located at 11745 San Luis Pass Road on Galveston’s West End. The park includes an educational wetlands preserve, beach access points, and public parking. Amenities include outdoor rinse-off showers as well as umbrella and chair rentals. 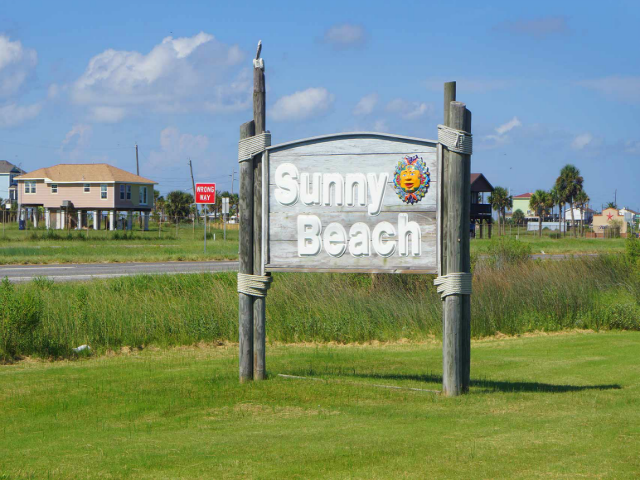 A local’s favorite beach, Sunny Beach is located on the west end of the island at the end of 8 Mile Road. The most exciting feature of Sunny Beach is that you can drive on the beach, park, and place your tent beside your car. You can surf, fish, swim, and fly kites. No glass bottles are allowed. There are no lifeguards or chair and umbrella rentals but this is a great place to search for seashells and get away from the hustle and bustle of the island. This beach gets quite crowded on summer weekends. There is no charge to access Sunny Beach. Be careful, the sand is very loose in some areas and it is easy to get stuck. Moody Gardens is the pride of Galveston Island. The highlights are the three themed pyramids: Aquarium, Rain Forest, and Discovery. 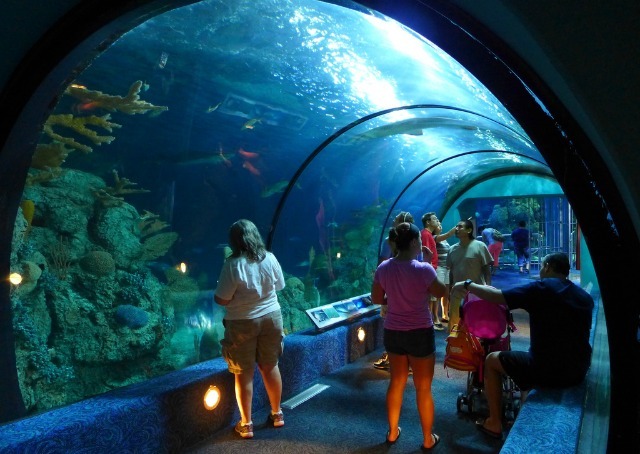 Explore the Aquarium Pyramid and tour the South Atlantic, the Caribbean and the North Pacific. Enjoy the Rain Forest Pyramid which has over 1000 types of luxurious plants from the rain forests of Asia, Africa and the Americas. Learn about the interesting world of science at the Discovery Pyramid which puts on a number of absorbing exhibitions. 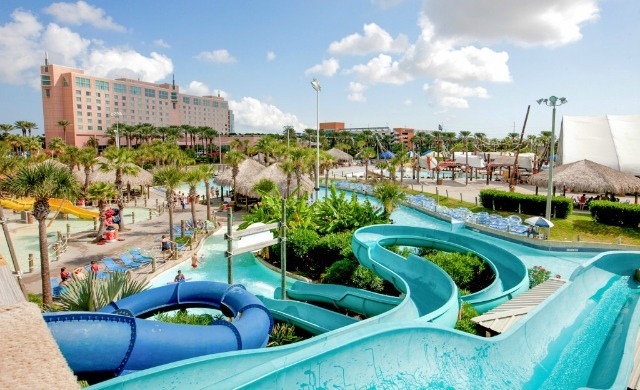 Schlitterbahn Galveston Island Waterpark features 35 thrilling water adventure rides. Experience the thrills of speed slides, tube slides, and a surf ride. The Galveston Island Historic Pleasure Pier is one of the few spots in the world that has this many rides over the water. You’ll be flying over guests on the Pier, soaring over the Gulf of Mexico and anticipating your next ride. 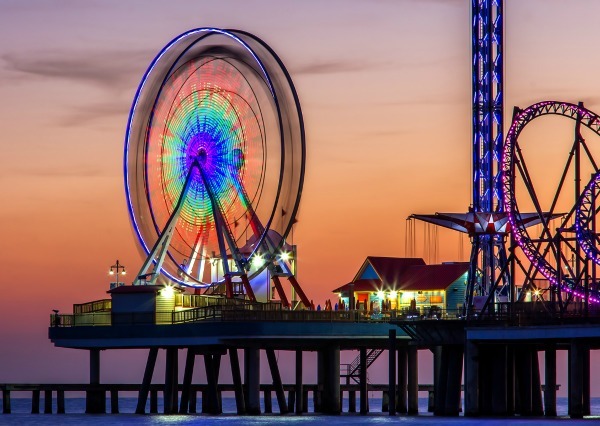 The family-oriented Pleasure Pier features 16 rides, midway games, food venues and retail shops. The Pier rivals similar parks like Chicago’s Navy Pier, the Santa Monica Pier and Coney Island’s Luna Park. Once labeled “the Wall Street of the Southwest”, the Strand Historic District is now home to superb restaurants, sensational boutiques and popular night clubs. 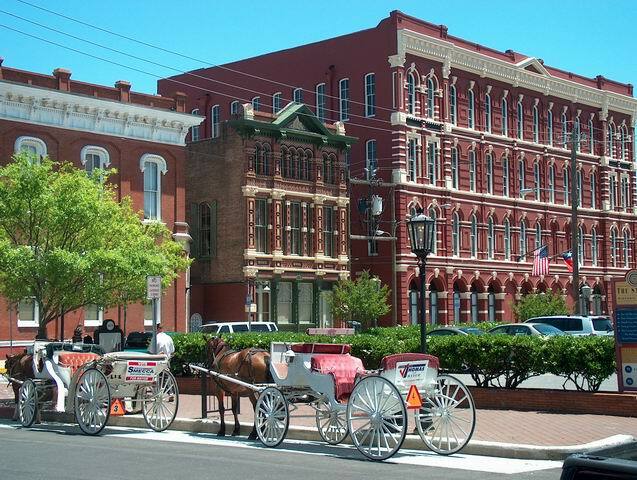 Take some time to enjoy the variety of shops in the district’s beautiful historic buildings, many of which survived the 1900 Storm, regarded as the worst natural disaster in U.S. history. La King’s Confectionery master candy maker will delight you by making their famous salt water taffy right before your eyes on antique equipment. 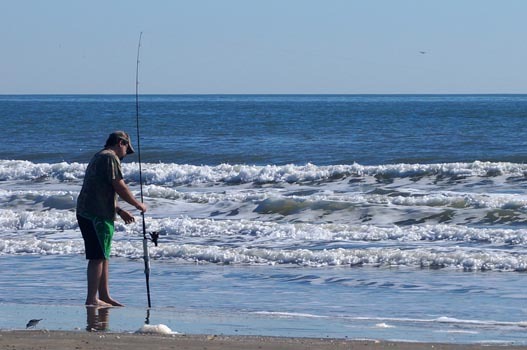 From surf fishing to charter fishing, Galveston Island offers something for everyone with a rod, a reel and a love of angling. You can fish the surf along most of the island’s beaches year-round. 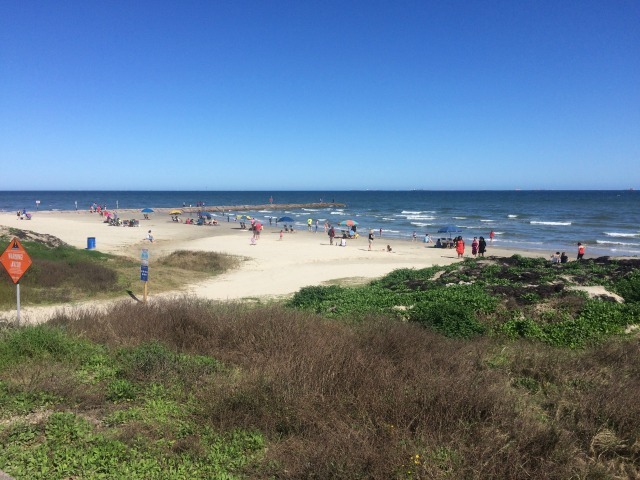 One of the best spots is Galveston Island State Park. 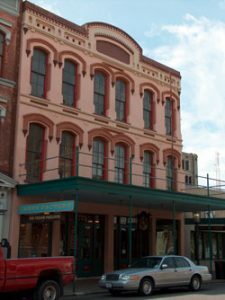 There are more than 2,000 buildings on Galveston Island listed on the National Register of Historic Places. 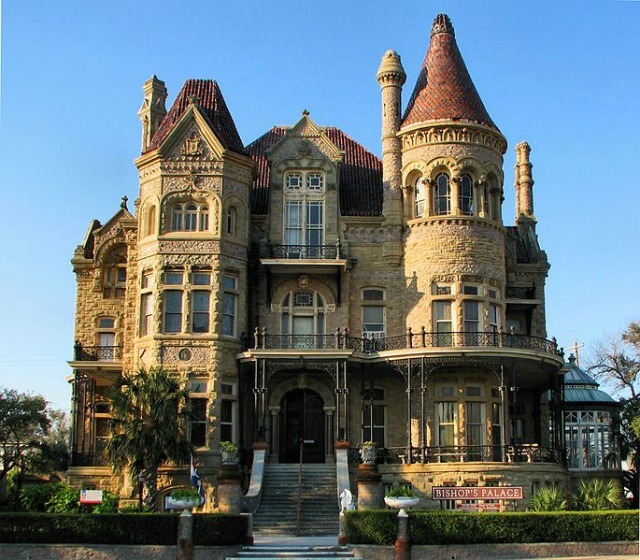 The 1892 Bishop’s Palace home is impressive as it is imposing. 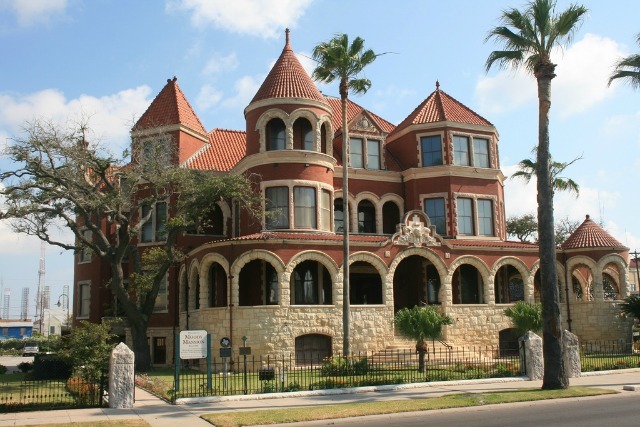 The home was constructed in 1892 during the golden age of Galveston’s prosperity and is located in the Historic East End District. Restored to its turn of the century splendor, the 28,000 square-foot, four-story structure was completed in 1895. Today, guests visit 20 rooms on a tour that depicts the home life of a powerful Texas family. 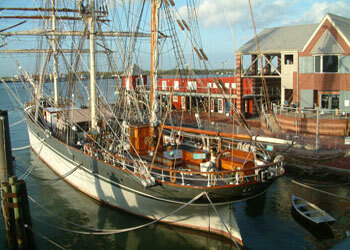 The Texas Seaport Museum is home to the 1877 Elissa. Walk the decks to imagine life on a merchant sailing ship in the late nineteenth century. 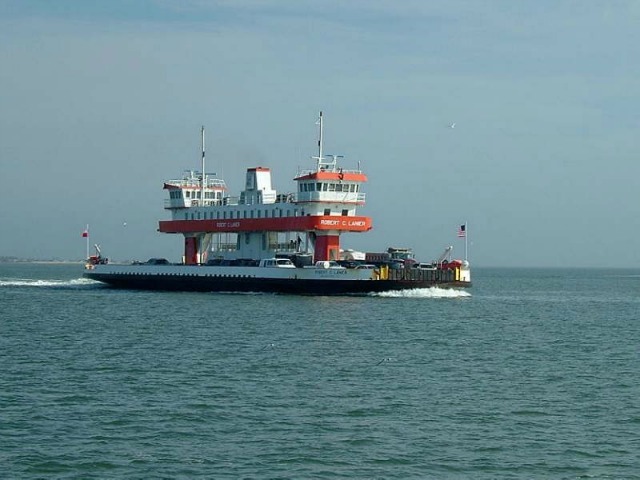 The FREE Galveston-Port Bolivar Ferry service is provided by TX DOT and is the only way motorists can cross the waterway between Bolivar Peninsula and Galveston Island. The 2.7 mile trip takes approximately 18 minutes to cross. Be on the lookout for flocking seagulls, floating pelicans and dolphins. Other highlights of your crossing is passing Seawolf Park, barges or cruise ships in the Inter-coastal Waterway and the shoreline of Galveston Island. The ferry is busy in the summertime. We recommend taking weekdays trips or early a.m. weekend trips. Being a coastal beach town, each day starts and ends with breathtaking shades of orange and pink cast across the sky like paint on a canvas. Jimmy’s on the Pier Restaurant & Bar located at 9001 Seawall Boulevard has the one of the best views in Galveston, with the only “over the waves” dining on the Island. On warm days, the restaurant and deck wall to wall doors open up all the way around to offer spectacular sunset views. Olympia The Grill at Pier 21 has a stunning view of the Port of Galveston with seating on a wrap-around patio. With the fans creating a nice breeze, it’s a great place to dine and enjoy a cold beverage while watching a breathtaking sunset. It’s a must see sunset spot. Shearn’s Lounge, the bar outside Shearn’s Seafood PrimeSteak which is located on the 10th floor on the west side of the Moody Gardens Hotel. The floor to ceiling windows present astonishing views of the Gulf and its fiery sunsets. Moody Gardens is located at 7 Hope Boulevard, Galveston, TX 77554. 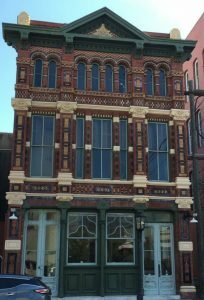 The Rooftop Bar is located above the Tremont House at 2300 Ships Mechanic Row in Downtown Galveston. It’s the city’s only open-air rooftop venue boasting comfortable sectional seating areas and bar-high tables. This upscale, outdoor patio bar is a great place to unwind. Whether you want to watch the cruise ships come and go, or the night lights come alive downtown, The Rooftop Bar has great scenic views in all directions as far as the eye can see. The sunset is stunning from here too. On a clear evening, you can see for miles across the harbor and bay.